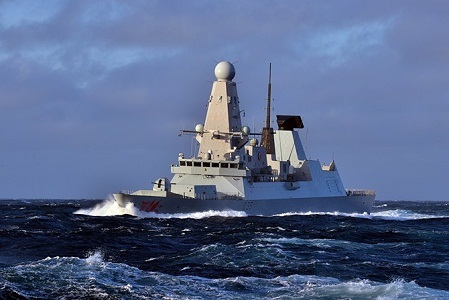 Karachi: The Royal Navy’s state of the art Type 45 destroyer HMS DRAGON is visiting Karachi as part of a multinational task force to participate in Exercise AMAN organised by the Pakistan Navy. The visit also underlines the strong UK-Pakistan relationship on trade, sporting and cultural links between the two countries. HMS DRAGON is the fourth of the Royal Navy’s six Type 45 Air Defence Destroyers and was launched on 7 November 2008. Earlier, the British High Commissioner Thomas Drew and officials from HMS DRAGON visited the Mazar-e-Quaid where they laid wreaths. They also hosted a lunch on board HMS DRAGON for senior officials from the Pakistan Navy. Speaking on his visit on-board HMS DRAGON, the British High Commissioner Thomas Drew said: “The strength of the UK-Pakistan relationship is highlighted by the participation of HMS DRAGON, one of the world’s most advanced warships, in Exercise AMAN. Our navies share a long history and continue to operate closely together, including through training, reciprocal visits and joint exercises. The last eight months have seen two Royal Navy ships in Karachi and one Pakistan Navy ship in Portsmouth. “HMS DRAGON is proud to be here in Pakistan to support our navy to navy relations and our wider trade aspirations with Pakistan. The UK supports the Pakistan Navy’s ongoing contribution to the Combined Maritime Forces counter-piracy and counter-narcotic operations in the Indian Ocean and looks forward to welcoming them back to leadership of a Combined Task Force, which they have undertaken on many occasions. HMS Dragon has been at sea for five months of a seven month deployment. As a direct result of its intervention, it has seized over £100M worth of illicit drugs which denies direct funding to terrorism across the Middle East and Africa.